Ruro LIS is the lifeblood of your lab. Staff stuck reloading pages, navigating unintuitive data entry screens and making the best of limited search features all translate to lost organizational performance. Your customers generate opinions about your business through the professional appearance of your online portal and report documentation. Online Client and Patient Portals. Results reports are delivered through the Client Portal (online). Results reports are delivered through the Client Portal (online).E-Mail. This video gives a general overview of RURO's LimitLIS solution. The laboratory information system with limitless possibilities. Q. What is LimitLIS® Cloud Service? LimitLIS® is a web-based application that supports CLIA compliance and HIPAA-related security and privacy provisions. 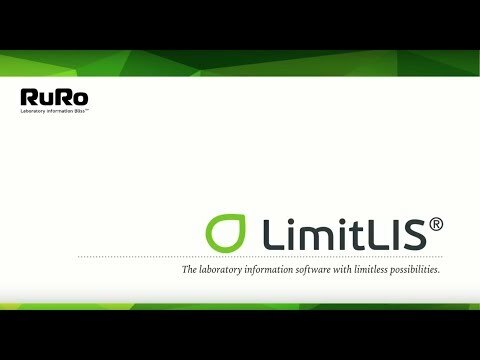 LimitLIS® is a hosted SaaS offering, allowing laboratories to devote resources away from IT, and leverage the proficiency and efficiency of LimitLIS® provider, RURO, Inc.
Q. What types of cloud offerings are available from RURO? RURO, Inc. offers both Public Cloud and Private Cloud deployment options. With Public Cloud, the users access LimitLIS® through an internet browser. Private Cloud option offers additional security as it is an extension of the internal customer network. RURO Software Support Team will notify you within a specified time frame to perform maintenance as required and minimize impact to your business. RURO, Inc. is responsible for maintaining the infrastructure of your cloud environment. Infrastructure Maintenance includes Installation, Updates Management, and Malware Protection. Q. How is the data backed up? An automatic backup of the database and the uploaded files is performed daily at 1 AM Eastern Time. Q. How does LimitLIS® support data migration from my legacy systems? LimitLIS® offers a CSV format file import as well as a developer API to assist in data migration from your legacy systems.